Konzert morgen (Donnerstag, 11.12.) im Projektraum: Shireen plays Crisis Folk! I am a travelling musician with a ukulele on a mission! Originally from the Netherlands, and currently hitchhiking back from Indonesia where I spent some time, helping my friends out with animal rescue and conservation projects. I occasionally performed there at benefit and solidarity gigs, ranging from fundraising for conservation, or awareness raising for farmers on East Java fighting against a cement factory on their land. I made up the genre ‚Crisis Folk‘ to give a name to the songs that I like to sing. Many kinds of crises manifest themselves in the traditional folk-songs that I like to borrow, they deal with excessive drinking, poverty and violence. Alongside these songs, I sing ‚activist love songs‘ about other, more contempary crises. About Europe becoming more and more like a fortress with the ever increasing border controls and violent repression of the ’sans-papiers‘ (undocumented people) and ’no border‘ activists. Or the damage that is done to ecosystems in search of profit. Yes, these are also truly lovesongs. As you cannot fight without loving. 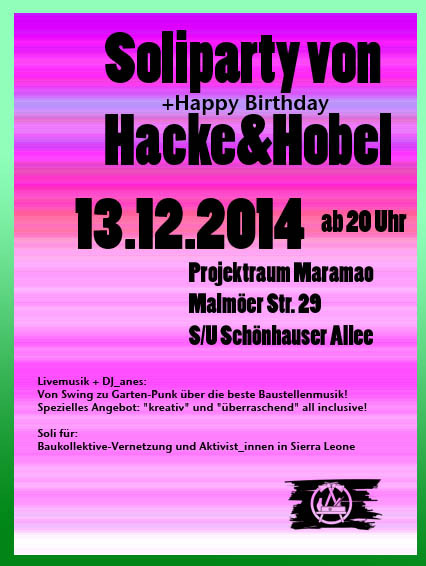 Party im Projektraum am 13.12.